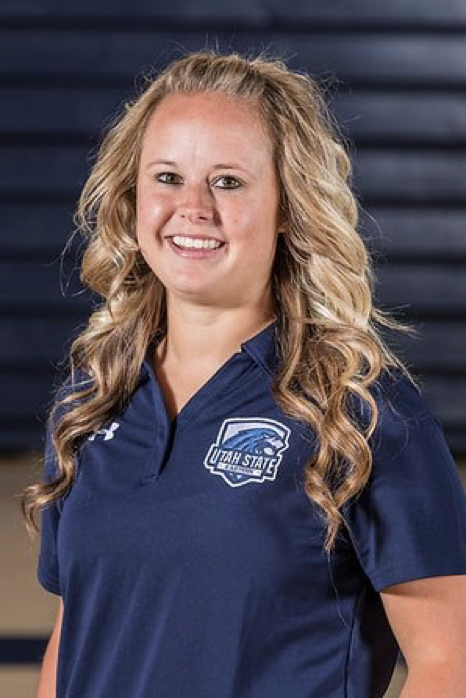 In August 2017, Utah State University Eastern added another member to the athletic training team: Raberta Johnson, who started working part-time as assistant athletic trainer and is working part time. She was a perfect addition and works well with Jess Brinkerhoff, head athletic trainer. Johnson grew up in Fairview, Utah. She is the sixth of seven children and is close with her family. Family is a big part of her life and she doesn’t know what she would do without them. She was raised on a farm and learned the value of a hard work ethic. She thinks her close relationship with her family comes from the daily time spent working on the farm and playing tennis with her siblings. Her whole family played tennis in high school and she especially loves the times she got to play against them. Once she graduated from Snow College, Johnson took a year off to work as a dental assistant, and continued her education at Southern Utah University. She explains how she wasn’t even thinking about athletic training at that point, but heard about the programs application deadline coming up and decided to go for it. She finished the program and earned her bachelor’s degree in athletic training while at SUU and met Brinkerhoff while he was in grad school. While attending SUU, Johnson was fortunate to find the love of her life, Shaun Johnson. Her brother in law had told her about him and vice versa, but they officially met each other at intramurals. After the first official date, they were always together and the rest is history. After graduating, the Johnsons decided to move to Price. Her husband received an accountant offer and they both agreed it was the perfect opportunity for him to get experience. Since being at USUE, Johnson and Brinkerhoff have had huge impacts on everyone they meet. They both have gone far and beyond what their job ‘enlists’ and truly cares about people. Some of duties and responsibilities this job comes with are paperwork, which is a big part of athletic training, recording all of the athletes treatment and injuries. The treatment aspect which includes stem, ice, heat, rolling out, etc. One thing the athletic trainers have added this year is injury prevention. This helps athletes avoid injuries in the first place by working on balance, strengthening muscles and becoming more athletic. If an athlete becomes injured, they help rehab them back to health. One piece of advice she gives to athletes the most who are injured or trying to prevent injury is to remember to stretch before and after a workout. It seems simple, but she knows first hand how many people forget to do it. Being versatile, Johnson loves from being outdoors, walking her dog, playing tennis and golf or any sports, to spending time with family, sewing, baking and cooking. If money and time were no object, though, she would love to get into quilting. Johnson claims she is an open book, but what many might not know is that she used to hate dogs. This hatred goes back to her childhood years when her neighbor’s dog used to chase her and her sisters. Once she got a dog of her own, she has loved them ever since. One quality that stands out to Johnson is when she sees someone put others first and who are always willing to help no matter what they have going on in their life. Some activities Johnson is involved in when she is not working are house work, homework and playing with her dog. She is also furthering her education and working on a nursing degree. Something the Johnsons are looking forward to this summer is a new addition to the family. They are expecting a baby boy on June 29 and can hardly wait. Johnson believes she is ready to become a mother and has every reason too. She has been babysitting since she was 8 and loves kids. She treats her nieces and nephews like her own and feels like she has had lots of experience. Excited seems to be an understatement when talking about her baby. One of her favorite foods are breakfast burritos, but she quickly decided all breakfast foods are good. She is one of those people who could eat breakfast at any time of the day. Her daily motto is, “Always try to be happy and look for the good in every way.” Johnson has got this down as she is always caught smiling and lights up a room wherever she goes. Johnson has made a big impact not only to the athletes and students, but also to the community. She has been admired by everyone around her and has been a perfect addition to USUE. Always smiling, kind, funny and an amazing friend, Johnson is someone you need to make sure you meet.